Inside one transparent plastic container on a rack of shelves is someone’s big toe. Inside another, someone else’s uterus. In the complex and bureaucratic health care system, this bright room and its rack of shelves are where lab samples come to be assigned meaning and translated into treatment. The sprawling building in a Spokane Valley business park houses Incyte Diagnostics, where many of Spokane’s non-blood lab samples come to be analyzed before doctors tell their patients everything looks good or that they’ll be needing some more tests or treatments. Samples fall into two broad categories: clinical or anatomic pathology, says Incyte COO Gary Gemar. Between those groups, labs provide about 70 percent of the diagnostic information doctors use to assess patients. Pathology examines what causes diseases — blood or other body fluid samples fall into the clinical category, and tissues, such as biopsy and surgery samples, are categorized as anatomic. Here at Incyte, the focus is on anatomic pathology, slicing and studying everything from the toe and uterus to some 95,000 pap smears a year. The process is a crucial one for doctors and patients, whether the tests are routine or because of special worries, and it’s one that’s becoming increasingly technologically advanced and competitive. Bruce Cutter, a hematologist and oncologist at Group Health, says fast and accurate lab results are “critical” for good patient care. With his specialty evaluating and treating blood disorders and cancers, Cutter says the many lab samples he sends out for analysis not only help him diagnose patients, but also help decide which treatment to use and assist in monitoring patients’ progress. While most tests he orders require no fasting or special behaviors beforehand, Cutter advises patients to always double-check with their doctor or nurse to see if there are any requirements to prepare for giving a sample. When a sample arrives at Incyte by courier from a hospital or doctor’s office, it’s assigned a bar code. That string of numbers and lines will follow the sample through the lab, from the desk where it’s checked in to the room where a piece about the thickness of a nickel is sliced off, placed in a small, brightly colored plastic container and treated in chemical solutions to preserve it. From there, an even thinner slice is set on a slide and stained for analysis by a computer, a medical professional or both, depending on the type of sample. Pap smear samples are sent through a machine that can recognize any abnormalities, which triggers them for a technologist’s review. Other types of samples, like tissue taken from a biopsy or that big toe, are analyzed by technologists and pathologists. 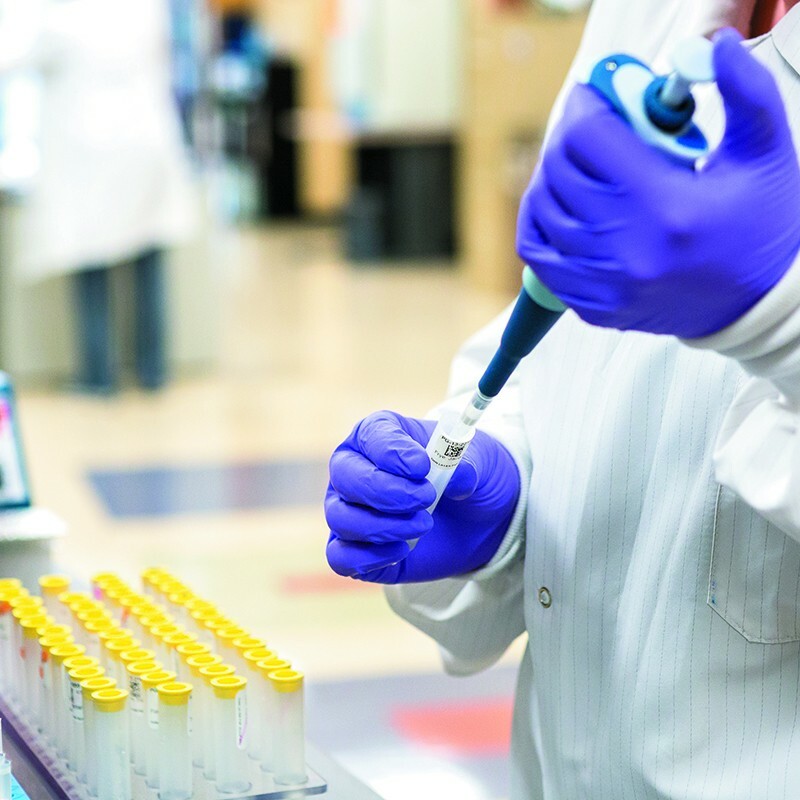 At Incyte, many of these pathologists have sub-specialities like urology or dermatology, so those types of samples are usually sent to them for expert review. As pathology assistants and doctors gaze into microscopes or at microscopic images projected onto a computer screen, they dictate what they see. That’s later transcribed and added to the sample’s information, which travels with that bar code it was given when it arrived. Sitting in white lab coats under fluorescent lights, technologists work day and night shifts to keep results moving quickly. They have education ranging from a two-year associate’s degree and on-the-job training to a full medical degree, depending on their job, and get ongoing education and training to keep up on new technologies and methods. Incyte touts its bar coding system as a way to do the obvious but crucial: make sure the right patient name and information is assigned to the right sample to avoid mix-ups. That system also allows each technologist or doctor along the way to pull up the same reports and information about the sample. In the future, the lab will likely invest in technology that allows slides to be “totally digitized,” Gemar says. With such a digital scanning process, doctors across different states would be able to more efficiently share and analyze samples. From hiring pathologists with specialties to planning for future equipment, it’s all part of staying the most attractive place for doctors to send their samples. Patient samples make their way to Spokane’s other major lab, PAML — Pathology Associates Medical Laboratories — from nearby Sacred Heart and states as far away as New Jersey, says PAML President and CEO Francisco Velazquez. The blood and tissue samples that come to PAML are “on the higher end of the spectrum, as opposed to routine,” Velazquez says, from cholesterol to leukemia tests. That’s because the equipment and medical expertise needed to analyze more complicated lab tests is too expensive for every doctor’s office or hospital to provide. Like the pap tests at Incyte, PAML uses sophisticated computers to look for irregularities in tests it gets high volumes of, like a cholesterol panel, and enlists a human eye if something is unusual. A blood test to look for a disease like leukemia, though, is seen by three experts at the lab before results are decided. Along the way, internal and external checks ensure quality — and competitiveness. “Every step of the way has checks and balances, sometimes double- or triple-checks to make sure that when we provide a result or interpretation it’s the best that can be provided,” Velazquez says. National industry groups perform inspections and blind tests where they send a sample to the lab to be tested and compare the accuracy of the results to other labs. Phlebotomists, who draw blood, are trained to double-check that they are taking the right sample from the right person, safety steps like hand-washing and disinfection are emphasized, and couriers use temperature-controlled vehicles to protect samples.